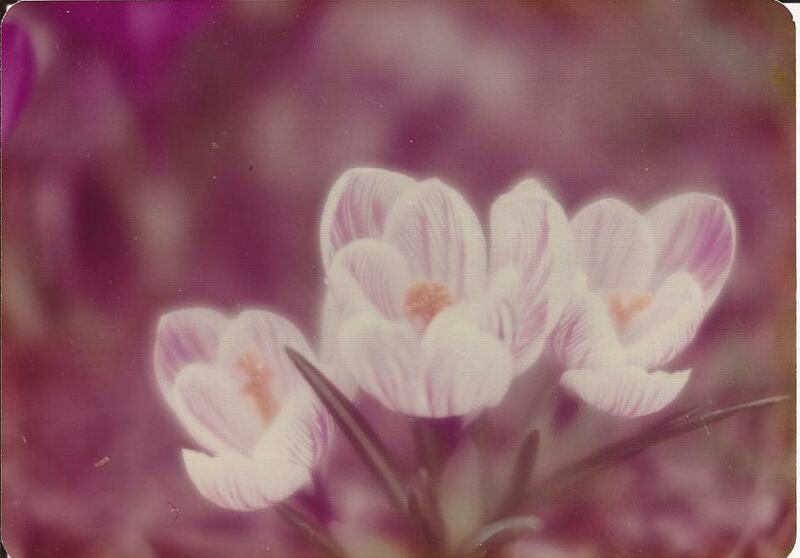 This photograph is from one of Mama's old books of flower photos. She had several books of just flower photos that she took. There was no date on this picture that I scanned. 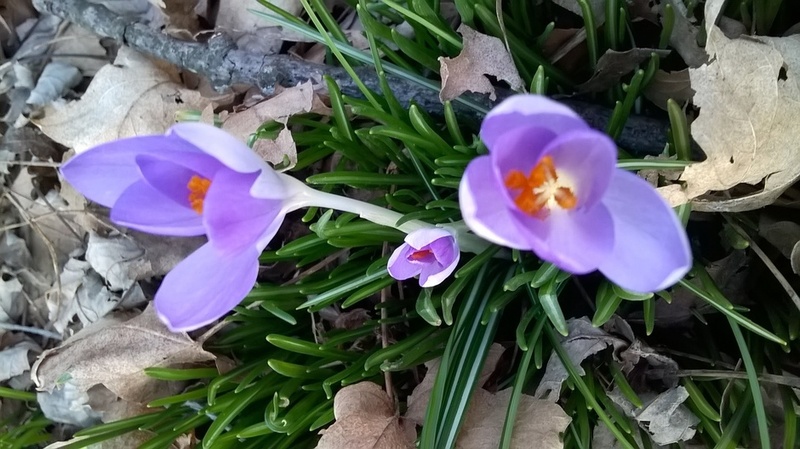 The crocuses have been in her yard for many years and are blooming again this spring. Just been out with seed for the birds. A “devil” wind blows around the feeder. It piles the snow in great drifts and freezes everything. Poor birds! Even the starlings come to the feeder in this weather. It is an ancient time and place I am in. My civilized world of today is as remote and far away as the stars shining down on this island. I am deep in this tropical jungle. The throb of voodoo drums is a haunting beat in my ears. Fire light casts grotesque shadows on the chanting dancers and the surrounding jungle. Yes, I have been arm-chair traveling again. This time via, my record of Jungle Drums. I can go anywhere in the world or time with my imagination, pictures, records or tapes. Note: This poem is from Mama’s poetry book. She doesn’t have a date when she wrote it, but I know the book is very old. She didn’t have a title for it either, but I typed it up just as she wrote it. 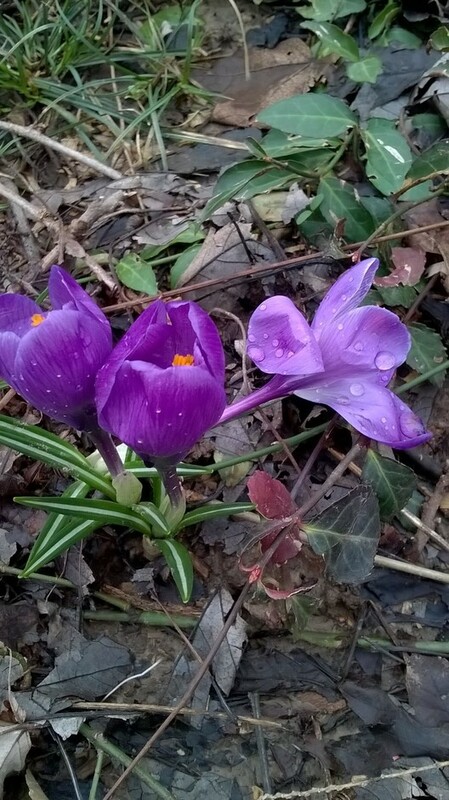 These are more of Mama's purple crocus flowers that she planted many years ago. They come up still every year with no extra care. They have spread all over the yard now in colors of purple, yellow, and lavender. She planted the tame crocuses like these, and also the wild lavender crocuses. The wild crocuses have even spread outside of the yard now and I shared starts of them with my friend, Jamie, last year. In the fall there is one place where purple autumn crocuses also grow. All of the spring crocuses are just now coming into bloom the past week. The autumn crocuses usually bloom sometime in October and last about a month. These purple crocuses were taken the same day as the photograph above this one. The rain had just stopped and I went outside just before five o'clock in the evening and got the photographs. 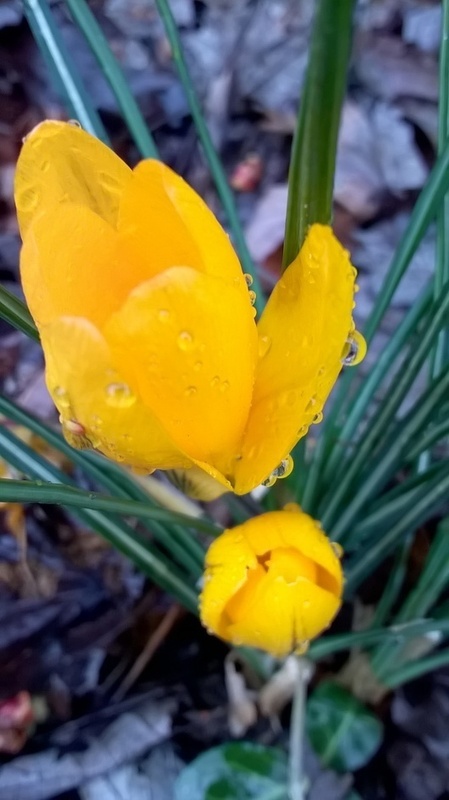 The raindrops were still clinging to the petals of the crocuses and they had just started blooming that day. The yellow ones had already been blooming for a few days. As you can see in this photograph, some of the crocuses were about beat down by the hard rain. Even damaged, though, this flower is beautiful and so I saved it on film to keep forever. Most of the crocuses that were just bent over by the rain, as soon as the sun shines again, will straighten up and be as beautiful as ever. Most of them on this sunny afternoon are now straightened up and if I hadn't seen them in their rain bedraggled state, I would have never known that they had been bent over before. 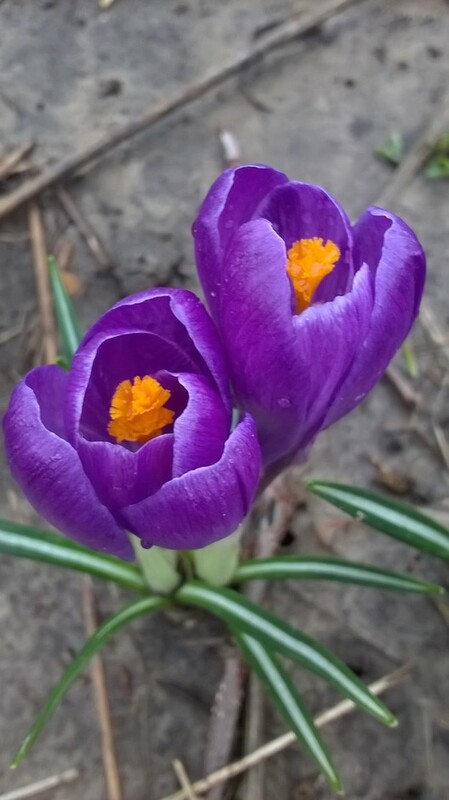 Crocuses, like many other flowers, also close up on rainy or cloudy days and at evening time, but open again when the sun shines. The spring crocuses do not last quite as long as the autumn crocuses, but they last several weeks. This is one of Mama's snowdrops that she planted. They also have one place that they come up every year with no care. They have been there for many years and have spread also. Usually they begin blooming the end of January, as they did this year, or in cold winters, as late as sometime in February. Cold or even snow does not hurt them. I have seen them actually coming up through the snow. They are the first flowers to bloom each year and last about a month. They are about gone now, the "Crocus Girls" taking their rightful turn to bloom now. Next will be the daffodils and tulips. The daffodils already have buds, so they will be blooming soon. All of the photos I took of the crocuses and the snowdrops were taken with the camera on Cell Phone Boy. 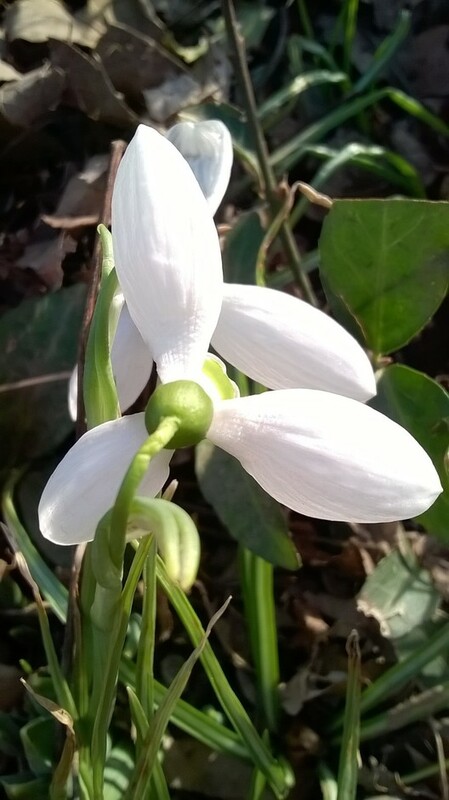 Here is the research I have started on snowdrops along with a few links for more information. I plan to do more research on this subject and will eventually share what I find out on this blog. 2. This article about snowdrops and how to grow them is from a website called “The Flower Expert”. These two photographs are from one of Mama's very old photo albums. They are probably at the river park here in Clarksville, Indiana, as that is where they usually went to get photographs of the river in its many moods and seasons and for picnics. Mama loved the river especially and said that "the river is always the same, but always different". Usually the river floods with the spring rains. This year there has been more rain that usual, starting earlier, probably due to climate change. One of Hammerhead's friends told me a few days ago that he was going to have to move out of his trailer and go to a campground for awhile because where he lives the water was almost up to his trailer. I don't think it would flood Mama's and Daddy's house unless there was another flood like the '37 Flood. Mama and Daddy both remember that and would tell me about it. 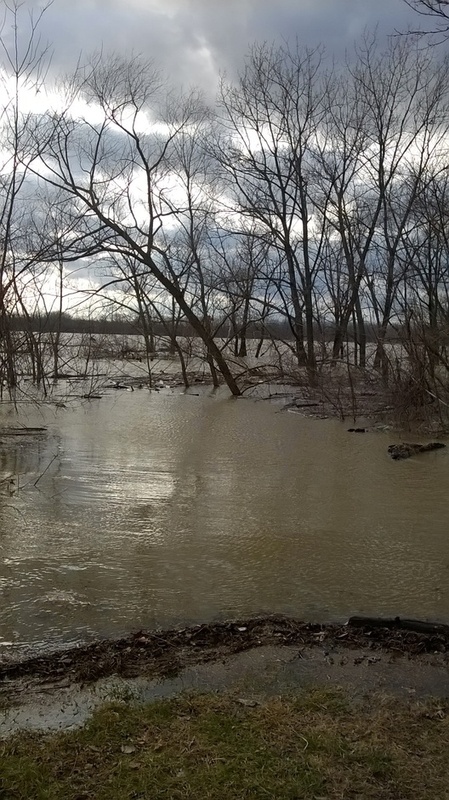 On February 19, 2018, Daddy's birthday, I went down to the Interpretive Center at the Falls Of The Ohio Park and took a video of the water almost up to one of the paths. Trees were standing in the water then and it has rained more since then and so the water is probably even higher now. I am not sure if videos can be posted on this website or not, or if so, how to do it. However, here is one of the photos I took that day. When Mama and Daddy took their photos of the river in flood the Interpretive Center was not there and the area was wilder. It was nicer then, but still it is good that they established the park. Otherwise, the whole area would probably be built up by now and completely destroyed. 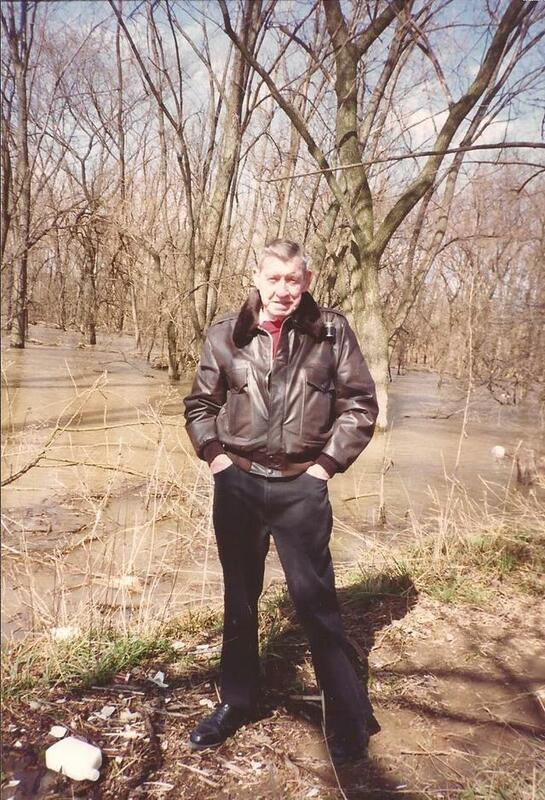 This is the photograph that I took of the Ohio River in flood at the top of the one of the paths at the Interpretive Center in Clarksville. It was only a little after 4 o'clock when I took the photo, but it had been a dark, stormy, rainy day and twilight was coming early. I left right after I got my photos. I may have published this photo before, but if so, am publishing it again now for spring. I had planned one of the "Wilderness Days", that were always every Tuesday for Hammerhead to get out and see a little bit of the country. Home Depot was just getting in the main part of their flowers so I planned that Wilderness Day for him to go there. He enjoyed riding around on the little cart and looking at all the flowers. I have many more photos of that day and will publish more of them later. I am still filing old rolls of film to One Drive and found some old photos of him that I took several years ago and will share some of them later. Most of the photos are good, but, of course, I will keep all of them. And here is a photograph of Gain taken the year we were married. Mama took it at the river on one of our visits to her and Daddy. Probably we had had a picnic there. The photograph was in one of her old photo books. It is after three o'clock now, time to quit work for awhile and feed the cats their supper and then start my supper and have a little Storybook Hour. I should have no problem finishing this post after supper, though. I am going to try to get a few more crocus photos before they close up for the evening to include, so can't work at the Computer much longer if I want to do that. There is still plenty of daylight and the days are getting longer, but I got a late start in the office today--almost 1:30 P.M. before I got started on the post. I need to finish it today, though, if it is to be for February as there are very few days left in February! That is part of the reason there is no chapter of Nightmare House this month and so asked Mama to be a "guest blogger" this month. 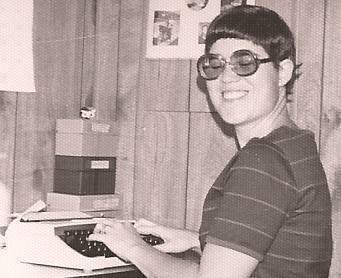 I had a lot to do this past month and did not get a new chapter of Mariette's book typed ready to post. Also, I need to start posting more of Mama's writing, so figured this month would be a good time to start. I had been posting her writing on Writers-Network each month, but as far as I know Writers-Network is gone and I still have not been able to find out what happened to that website. Until I can find out for sure that they are gone and not coming back, though, I am not removing the links on my posts here yet. 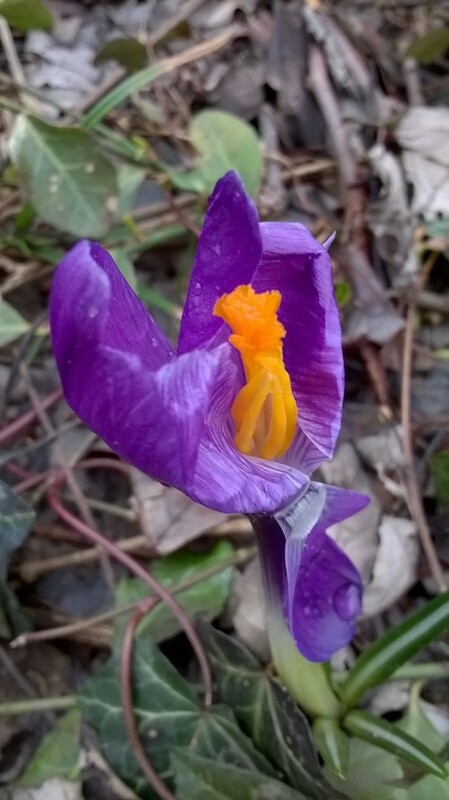 Anyway, it is going on three thirty now, so will save my work and when I get back if I can get a few more crocus photos I will post them with the diary entry and finish the diary post. I will include news of what is coming up in Mariette's book next and when I hope to be able to publish more chapters of it then. I also have a little research with a few links that I will add to the post. I have research on snowdrops that I have started and also research on Ruby Jean Jensen that someone may be interested in with links. I started reading one of Ruby Jean Jensen's books, House Of Illusions and am still reading it. It is a very good book and available on Amazon. It is 20 minutes till seven this evening as I finally get back to finish the blog. I did get outside and got a few more crocus photos, but the sun was shining directly on them and although I will save all the photos, most of them weren't worth posting. The crocuses that were in the shadows already were starting to close up. However, I got enough photos to finish this blog post and will still have time to get more photos later for future blog posts. This is one of the striped crocuses. I got several photos and a video of them, which mostly turned out good. 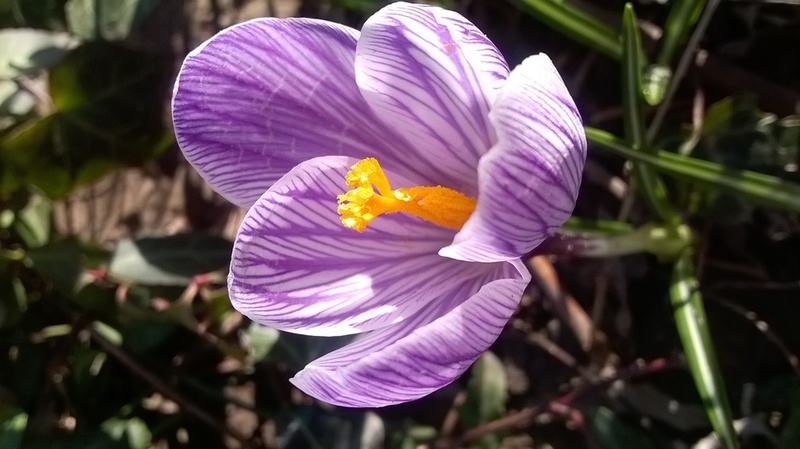 This is the best photo of the striped crocus. It is the same one, I am sure, that Mama took the photograph of so long ago and that I posted at the beginning of this blog post. This is one of the wild crocuses that have spread all through the yard and outside the yard and along the fence. I could not get any photos good enough to post today although there are more of the wild crocuses in bloom than there were when I took this photo a few days ago. The sun was wrong to get a good photo when I was out this afternoon. Getting back to the diary entry now, I have been doing a lot of sewing. I am making more patchwork items. I posted in the March and April 2017 blogs about how to make crazy quilt patchwork so I won't go into the directions for that again here. If you want to read those posts for directions and photos of how to do this, check those posts in the archives. I am making tote bags now and also potholders with crazy patchwork. The tote bags have flower and other photographs on them. Hobby Lobby has special transfer paper that you can use to transfer any photo to cloth. In a later post I will include some photos of some of the finished items. I am making them for gifts and a few to keep, but am photographing everything so I can post directions for making the items. If you want to try doing this before I get around to posting another blog about it, check the old blog posts and also talk to the people at Hobby Lobby about the special transfer paper they have. I am also working on improving and planting more flowers and some vegetables in my yard this year. It is too early to plant anything yet, but I am preparing the areas I want to plant on nice days. I will post more about this project also, along with sharing links to some of the many helpful garden reference sources I have found, both books and websites. So check back again later for this information. As I mentioned before, I have gotten behind on my writing, spending a lot of time on these other projects, and did not get any chapter of Mariette's book typed up for this month. There probably won't be any Nightmare House chapter for next month or April either so instead I will post a couple more entries for Mama's Flower Garden. I have been neglecting doing anything to her page since I created it for her, so that is important too, I think. The material I'm posting for her this month and that I will post for March and April is already typed up and ready to use because I originally published it on Writers-Network. Eventually I intend to post everything I had on Writers-Network here. I posted every month there for a couple of years so I have quite a bit, part of it her writing and part of it mine. In May I hope to finally have a few chapters of Mariette's book typed so that I can get back to posting a chapter every month for her, at the beginning of each month. So in May, hopefully, the next chapter of Nightmare House that I will be posting will be titled Jack Simpson: The Dark Store. Jack Simpson, if you have been reading the story so far, you may remember is one of the three neighbors who found old Simon LaGrange frozen to death in his home during a winter blizzard over thirty years before Curt and Mariette bought the old house and started fixing it up. 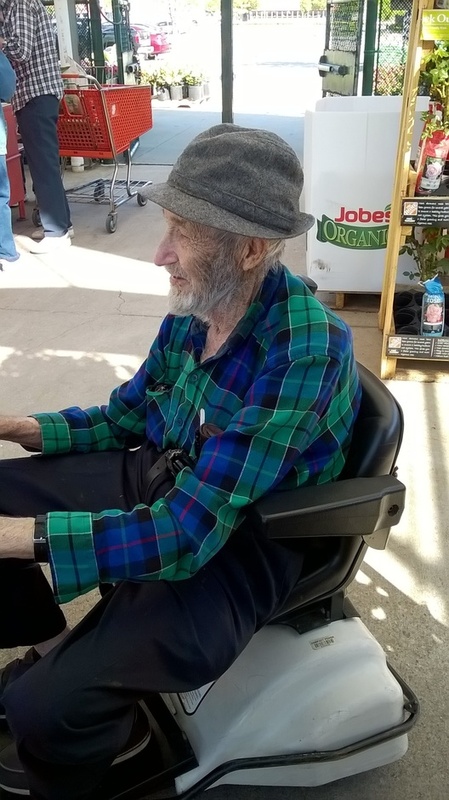 Jack Simpson still owns the small old-fashioned grocery store in Old America that used to deliver weekly groceries to Simon. This is going to be a very creepy chapter too with a creepy nightmare scene as part of the main chapter. Jack Simpson will dream about his own store closed up and boarded up, out of business. Mariette will share that same dream and wonder what it means. This chapter will be Jack's chapter, told from his point of view, even though the nightmare scene will be also partly Mariette's point of view. Later Mariette will shop in the Old America store, which is based on the very real Young America store where Gain and I bought steaks. It is long gone now and probably the owner, an old man then, has been gone for many years too. The store where Mariette shops looks exactly like the one I remember. The supernatural part of the story is, of course, fiction, as is Jack Simpson himself. After this chapter, the story will return to Mariette's and Curt's chapters, told from Mariette's point of view. The chapter after "The Dark Store" chapter will be an account of the day Curt and Mariette finally moved to Carrollton Location. The next chapter after that will be about how Mariette fixes up a room in the old house as her library and office. After those two chapters, although in the original book, there were other chapters after that, Mariette and I have decided that we'd better write a few chapters about the beginning of hers and her mother, Nettie's efforts to learn the history of the old house. Mariette wants to know the history of the old house very badly. And Nettie, for reasons of her own, believes that it is very important to learn the old house's history so that she can know what to do to protect her daughter from the long shadows of the past that she feels are reaching out more and more to harm Mariette. Nettie believes, of course, that Mariette is in even more danger from that past after she and Curt have moved to Carrollton Location. And Mariette believes more and more that the old house's past, if she can just learn what it is, is hers and Curt's future. 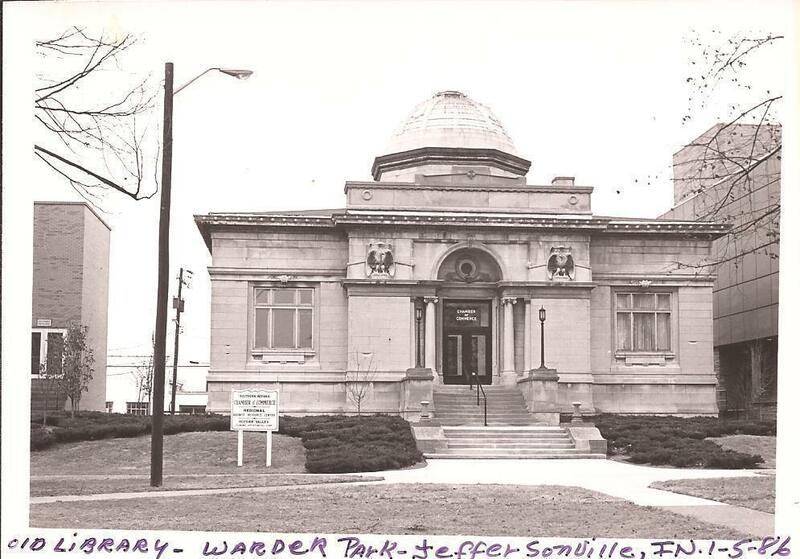 So it would not make sense for either of them to delay this project any longer than necessary, especially when they are actually in Carrollton Location now and can talk to people who may know about the old house's history and can also see what information the local library may have. Mariette and Nettie will, of course, plan their trips to the library so that they can also shop in town and eat lunch in town. In those chapters I will also include links to any of the real stores and restaurants in Logansport that the fictional Libertyville is based on. I don't know how many of them might still be in business anymore, but I am sure the library is still there and will include a link to that. So, even though this part of the book could be compressed into one chapter, Mariette would never allow me to do that and deprive them of their "Girls' Days Out"! And her book is going to be a continuing never-ending "soap opera" type of story with a "creepy-crawly" ghost twist, so there would be no reason for me to deprive them of their outings in an attempt to save space in the book. These chapters will also have the new and surprising information (surprising to Mariette, that is, not me) that getting information about the old house's history from the old time residents will be much harder than finding information at the library. Since she doesn't yet know the tragic story of Simon's death or the local people's superstitious fears about the old house, she doesn't know, as I do, that they will be reluctant to talk about the past. This will just be briefly mentioned in these chapters at this time, though, but slowly in future chapters Mariette will get them to talk about the past a little bit at a time. So this, as well as the library research, will be foreshadowed in these chapters, but there will be future ongoing regular chapters dealing with Mariette's and Nettie's efforts to find out the truth about the old house's past. Finally, before calling the blog post complete for this month, here is what I have found out so far about Ruby Jean Jensen, author of House Of Illusions that I am reading now and took my Storybook Hour to enjoy more of this book this afternoon. Later, I will get back to doing some book reviews and this will be one of the books I review. I will also do some more research on Ruby Jean Jenson and Reocities, which I found by accident when I was doing the research. I will share what I find later. 1. This is Amazon’s author page for Ruby Jean Jensen. It does not have much information about her, but it does list 14 of her books with links to the book information and ordering pages of each one. There is no author photo on the page. There is also an option to “follow” the author, which I selected, and also bookmarked the main author page. All of the books are paperbacks. All of them are available only from third party sellers working for Amazon, but not directly from Amazon. The prices range from $1.70 for one titled “Night Thunder” up to $1,992.21 for one titled “MaMa”, which is new and must be very rare! Only one, titled “The Girl Who Didn’t Die” was listed as currently unavailable with the additional information that Amazon didn’t know if or when it would ever be in stock. I’m sure somebody somewhere has a copy for sale, though. Prices appear to average around $15 for most of the books. This link will take you to Amazon’s Ruby Jean Jensen author page. This is the book page on Amazon for this title, which wasn’t listed as one of the books on her author page for some reason. There appear to be plenty of used copies starting at $7.04 and some new copies starting at $62.62. All of them are only available from third party sellers and all are paperbacks. If you search for “House Of Illusions” on Amazon without the author name, as I did, there are other books by different authors also listed and they will also come up in the search. However, when I was trying to find this book again and did not remember the author, but only the title, when I saw the description of the book I knew it was the one I had before. The cover on the one I ordered is different from the original book I had so evidently there was more than one printing of it. The copy I have is listed as copyright 1988 and First printing: April 1988 and no other printing listed. It was published by Zebra Books Kensington Publishing Corp., 475 Park Avenue South, New York, NY10016. Zebra and Kensington published a lot of cheap mass market paperbacks in the 1980’s and I think most authors didn’t make back their advance so only got the $1000 or so advance they were paying then. I think that probably a lot of books were copyrighted by the company, not the author, although am not sure of that. The copyright on this book is by Ruby Jean Jensen. She was very popular back in the 80’s, so was probably making enough money for the publisher by then that she could insist on keeping the copyright in her name. I haven’t checked on this yet, though, either. This website is a fan site obviously made with love and respect for the author. It has links to pages listing her books, and other information on the main page. The book page lists 30 books with information about each book. Evidently this is a complete list since the website was made as a tribute to her and I would think a dedicated fan would know how many books she wrote. There is some information about him on the website also and how he came to start her official website. His name is Aaron K. Thompson. According to him, most of her books were published in the ‘70’s, so I guess her main career spanned the 70’s and 80’s. Some of the links on the page don’t work anymore, and the computer either says they can’t find them or they are old links. Those are the links to join the fan club, sign up for a newsletter, view or sign the guestbook, and to e-mail the webmaster. The links leading to the books and information about the webmaster still work. I bookmarked this website. This website is powered by Reocities. I bookmarked this site also and will go back and read more later as the home page of Reocities says that they are salvaging as much as they can of the old Geocities websites. At one time my friend and publisher, Earon Barnes, had his website with Geocities when the Internet first started. I have been able to find some of his pages archived by Internet Archive and would like to find them all if possible to salvage and possibly publish on my website for him. (Earon died in 1988). That is a project for another research search, though, so for now I just bookmarked the page. I did read part of the website, though, enough to find out that Earon’s website may be one of the ones that are archived here. If not, the Reocities people are also looking for links to the old Geocities pages that they don’t have yet so they can be included. I also haven’t had time to search the Archive yet to find out how much of Earon’s material may be on it, but did use the Archive’s WayBack Machine to find out that they have some pages. All you need to search for old websites on the Wayback Machine on the Archive is the original URL and if the Archive has the website, the Wayback Machine will bring it up. I have the original address, Earon gave me, which is how I found his website on the Wayback Machine. I will definitely go back and do more on this later, but that will be a search project of its own. This is the address of the main Reocities page. This short article is from Wikipedia. 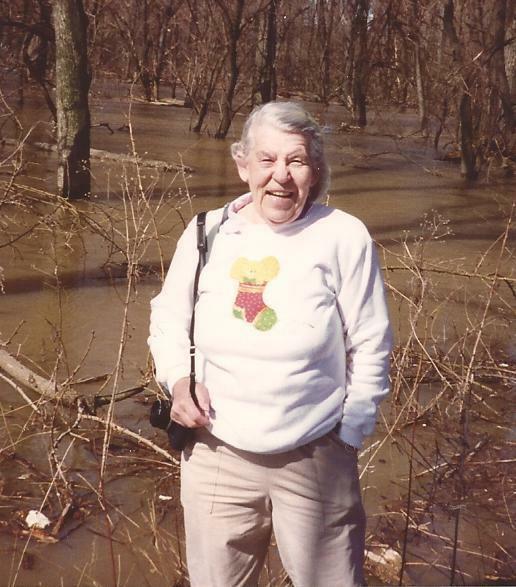 According to the article she lived from March 1, 1927 to November 16, 2010. They list 30 books she published between 1974 and 1995, all published by the big mass market paperback publishers of that time. There are a few links in the reference sources at the end of this article that lead to a little more information. This research to be continued later. Have so far been unable to find out much about Ruby Jean Jensen’s personal history, but will look more later. 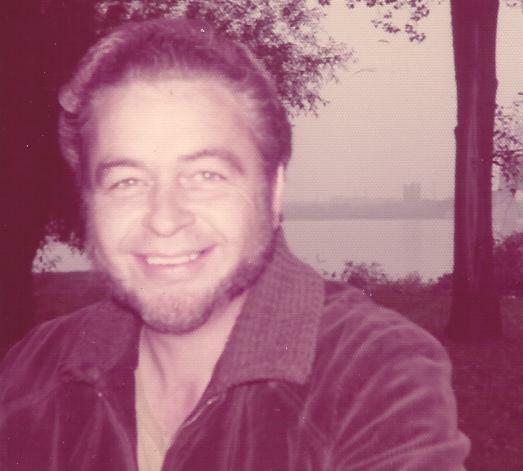 Evidently the Official Ruby Jean Jensen website is very old, since it is archived by Reocities now and also because the author of the website writes about Ruby Jean as if she is still alive and writing and mentions that he once visited her. From what I’ve been able to find out so far about Ruby Jean, I would say that she is like Henry Bellamann, the author of Kings Row, she was very popular at one time, but time has moved on, and except for dedicated fans, she has been largely forgotten. So personal historical information about her will be harder to find, but not impossible to find when I have the time to do more research. I will finally close out the blog with one more photograph. If you find mistakes, I haven't proofed the post yet. It's going on eight o'clock now so I will do that tomorrow and fix any mistakes I find and post a final note to let everyone know that the blog has been proofed and is officially done for this month. Until next month. Coming up next month and also in April will be more guest blogs from Mama. She will share a couple of her very old March diary entries and one of her poems with you in March. In April she will share another diary entry from her long ago April diary and another poem with you. The yellow crocuses bloom before the purple ones for some reason so when I went out to take more photos for the blog this afternoon all of the yellow ones were faded so I am sharing this photo of the yellow ones I took last year instead. I worked in the yard all day yesterday before the forecast-ed rain for today and tomorrow. I got quite a bit done and most of the old dead flowers stalks cut down to make room for new flowers, but then was too tired to proof the blog. Instead I finished reading House Of Illusions that late afternoon and evening. I did get out and take a few more photos in the late afternoon, though, and saw that the first daffodil was in bloom. That is another sure sign of the advance of global warming! I remember back in the 80's and 90's when Gain was alive and we lived 180 miles north of here, our daffodils didn't bloom until May. When we would visit Mama and Daddy, Mama's daffodils were in full bloom in April. 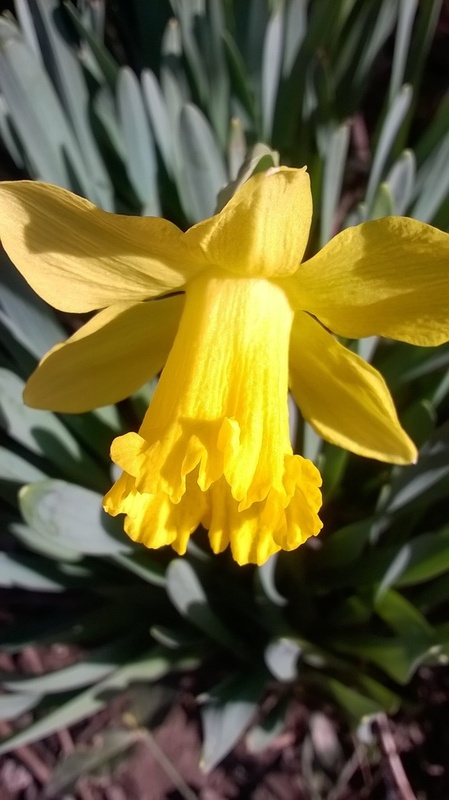 When we would visit Gain's relatives down in Virginia, in the tri-state area where Virginia, Tennessee, and Kentucky come together in a point in the mountains, the daffodils would be blooming in March. I remember being so amazed to see them all in full bloom so early. I don't remember exactly when Mama's daffodils started blooming in March instead of April, but this is the first year I've seen them blooming at the end of February here. Probably, if we hadn't had the brief few weeks of bitter cold weather at the end of December 2017 and January 2018, they would have been blooming about the middle of February this year rather than the end. From what I have been observing about this for a long time, judging by the dates the flowers are in bloom, our climate here in Southern Indiana is now what it used to be in the tri-state area back in the 80's and 90's. Since I haven't been back down there for many years or back home either, I don't know what the climate might be in those places now. I know it was already getting much warmer in the 80's and 90's up home than it was in the 70's when Gain and I were first married, although no one was much talking about climate change then. I just have to proof this blog once more and then will consider it done. I proof it once in manuscript form, make corrections, and then proof and check the links once more in published form. Here is a photo of Mama's first daffodil in bloom yesterday on February 27, 2018 Tuesday. 2:36 P.M. on a rainy Wednesday afternoon this last day of February 2018 and the blog is proofed, all links work, and officially published just in time before February is gone! In a few days I will try to get the March blog posted so that I can start posting at the beginning of each month rather than the end, and so have time during the rest of each month to get more books ready to publish with Bookemon and also get blog material typed up ahead to have ready to use. I hope you enjoy this post and find something of interest. Until next month.